Menthol is an organic compound that occurs naturally in mint and some other plants. It can be extracted from the leaves by distillation, but is more commonly made synthetically. Pure menthol is a crystalline solid, but it is often used in the form of peppermint oil. It produces a sensation of coolness in the mouth or when applied to the skin and can act as a mild anesthetic. The compound is widely used in cough and cold remedies because of its soothing effects and as a flavoring in candy, chewing gum, medical products and cigarettes. More specifically, the biosynthesis of (−)-menthol takes place in the secretory gland cells of the peppermint plant. Geranyl diphosphate synthase (GPPS), first catalyzes the reaction of IPP and DMAPP into geranyl diphosphate. Next (−)-limonene synthase (LS) catalyzes the cyclization of geranyl diphosphate to (−)-limonene. (−)-Limonene-3-hydroxylase (L3OH), using O2 and NADPH, then catalyzes the allylic hydroxylation of (−)-limonene at the 3 position to (−)-trans-isopiperitenol. (−)-Trans-isopiperitenol dehydrogenase (iPD) further oxidizes the hydroxy group on the 3 position using NAD+ to make (−)-isopiperitenone. (−)-Isopiperitenone reductase (iPR) then reduces the double bond between carbons 1 and 2 using NADPH to form (+)-cis-isopulegone. (+)-Cis-isopulegone isomerase (iPI) then isomerizes the remaining double bond to form (+)-pulegone. (+)-Pulegone reductase (PR) then reduces this double bond using NADPH to form (−)-menthone. (−)-Menthone reductase (MR) then reduces the carbonyl group using NADPH to form (−)-menthol. Why is the mint cool? Menthol's ability to chemically trigger the cold-sensitive TRPM8 receptors in the skin is responsible for the well-known cooling sensation it provokes when inhaled, eaten, or applied to the skin. In this sense, it is similar to capsaicin, the chemical responsible for the spiciness of hot peppers (which stimulates heat sensors, also without causing an actual change in temperature). TRPM8 is an ion channel, upon activation it allows the entry of Na+ (sodium) and Ca2+ (calcium) ions to the cell that leads to depolarization and the generation of an action potential. The TRPM8 protein is expressed in sensory neurons, and it is activated by cold temperatures and cooling agents, such as quite menthol and icilin (a synthetic super-agonist of this channel). The TRPM8 channel is a homotetramer, composed of four identical subunits with a transmembrane domain with six helices (S1-S6). The first four, S1-S4, act as the voltage sensor and allow binding of menthol, icilin and similar channel agonists. 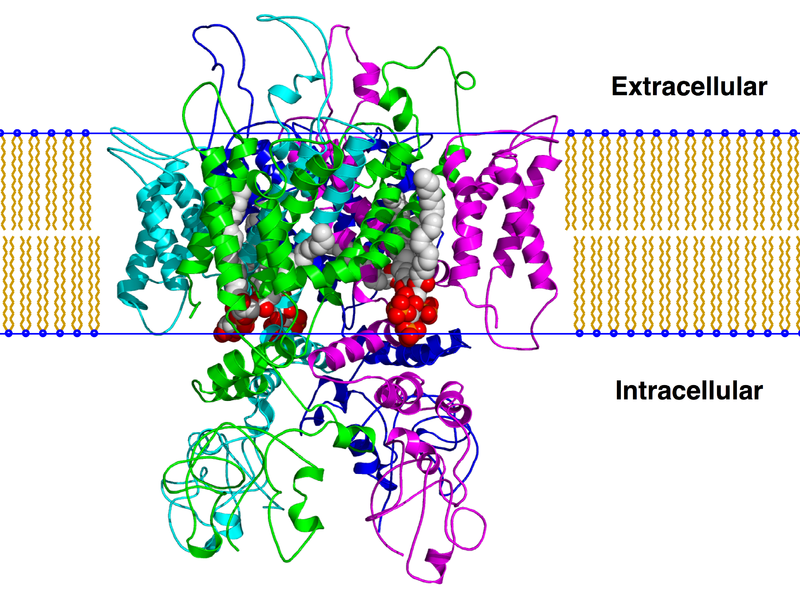 S5 and S6 and a connecting loop, also part of the structure, make up the pore, a non-selective cation channel which consists of a highly conserved hydrophobic region. A study in cold-based pain via topical application of menthol was conducted in humans. The experiment was done in a double-blind two-way crossover study by applying 40% L-menthol to the forearm, using ethanol as a control. Activation of the TRPM8-receptor channel (the primary menthol receptor channel) resulted in increased sensitization to the menthol stimulus. To investigate the mechanisms of this sensitization, Wasner et al., 2004, performed A fiber conduction blockade of the superficial radial nerve in another group of subjects. This ended up reducing the menthol-induced sensation of cold and hyperalgesia because blocking A fiber conduction resulted in inhibition of a class of Group C nerve fiber nociceptors needed to transduce the sensation of pain. They concluded menthol sensitizes cold-sensitive peripheral C nociceptors and activates cold-specific A delta fibers. Punctate hyperalgesia is due to central sensitization based on the ongoing activity in the sensitized menthol-sensitive C nociceptors, which are shown to respond specifically to the cold stimulus in a variety of mammalian species. The methods of the Wasner lab demonstrate use of topical menthol in humans to show the role of these C nociceptors in pain sensitization, without which response to menthol and related agaonists is abolished. As is common in response to many other sensory stimuli, much experimental evidence exists for the desensitization of human response of TRPM8 receptors to menthol. Testing involving administration of menthol and nicotine-containing cigarettes non-smokers, which induced what they classified as an irritant response, after initial sensitization, showed a declining response in subjects over time, lending itself to the incidence of desensitization. Ethanol, with similar irritant and desensitization properties, was used to control for nicotine, to distinguish it from menthol-induced response. The menthol receptor was seen to sensitize or desensitize based on cellular conditions, and menthol produces increased activity in Ca2+-voltage gated channels that is not seen in ethanol, cyclohexanol and other irritant controls, suggestive of a specific molecular receptor. Dessirier et al., also claim the cross-desensitization of menthol receptors can occur by unknown molecular mechanisms, though they hypothesize the importance of Ca2+ in reducing cell excitability in a way similar to that in the capsaicin receptor. Currently no reported nutrient or herb interactions involve menthol. (−)-Menthol has low toxicity: Oral (rat) LD50: 3300 mg/kg; Skin (rabbit) LD50: 15800 mg/kg.